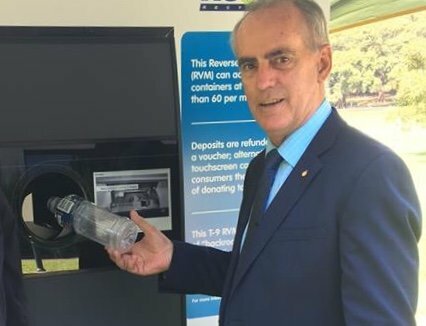 Firstly, I wish to state my support for the container deposit scheme, however the rollout of the ‘Return and Earn’ scheme so far has had mixed reception and with limited drop-off points in western Lake Macquarie, I understand why I'm receiving complaints from some residents. If you’re not yet familiar with it, it’s the scheme where you earn 10 cents for each barcoded drink container you recycle through an approved reverse vending machine, or in some cases at an over-the-counter collection point. The objectives are good but the current reality is far from what was envisaged. It’s early days for the scheme and I know it is being expanded so hopefully we can get more collection points in our area. I would like to see a reverse vending machine at Toronto as the next location but also at Morisset or Cooranbong to complement the over-the-counter collection point at the Bay Hotel at Bonnells Bay. I’ve been told that the contractor (TOMRA Cleanaway) is in negotiations to install a second collection point somewhere on the western side of the lake. My preference is for Toronto. What do you think? Additionally, I know that Lake Macquarie council is in talks with Solo about what happens to the bottles and cans that go into household recycling bins. They're working on a way which would send those containers through the 'Return and Earn' scheme, with all money being returned to ratepayers via reduced waste collection fees. Hopefully that is worked out soon because it would provide some sort of compensation to those who can't get to the reverse vending machines.